Read the original article published on Newshub here. 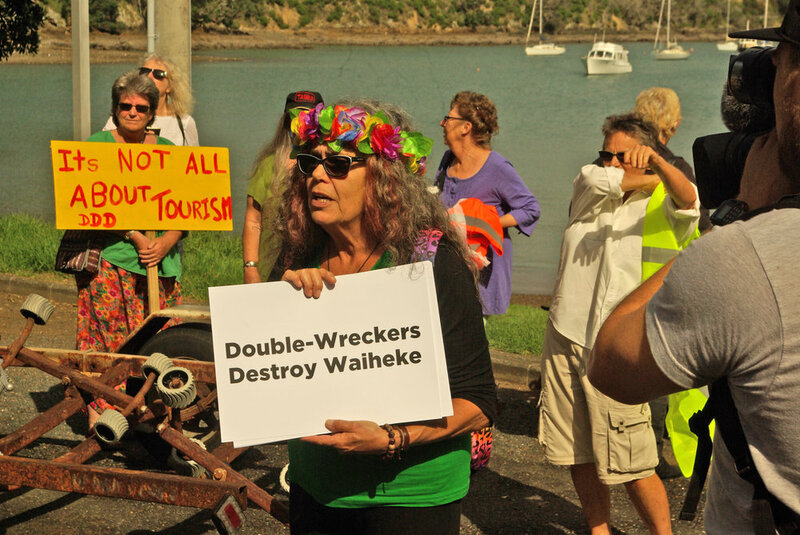 Around 150 vocal protesters have blocked tourists on Waiheke Island from travelling by bus to the island's main centre. Demonstrators blocked the left lane of the road from Matiatia Ferry to Oneroa Village, refusing let double-decker buses pass. Bemused tourists were forced to get out and walk the 1.7km journey instead. The two-storey buses were introduced by ferry company Fullers to service record tourism demand. But they've also been the subject of a local campaign, which alleges they've forced residents off the roads and caused damage to buildings and trees. Two-thousand people have signed a petition calling for the buses to be removed. Protest organiser Stephanie Honeychurch told Newshub Waiheke doesn't have the infrastructure to cope. "They maybe the same width and dimensions on the ground, but they're heavy on our roads. Our roads are narrow and they're tree-lined. [The buses are] unsuitable, unnecessary and unattractive." Some of the chants planned, according to the event's Facebook page, were "Double-decko - dead gecko", "Don't be a mug, Doug! 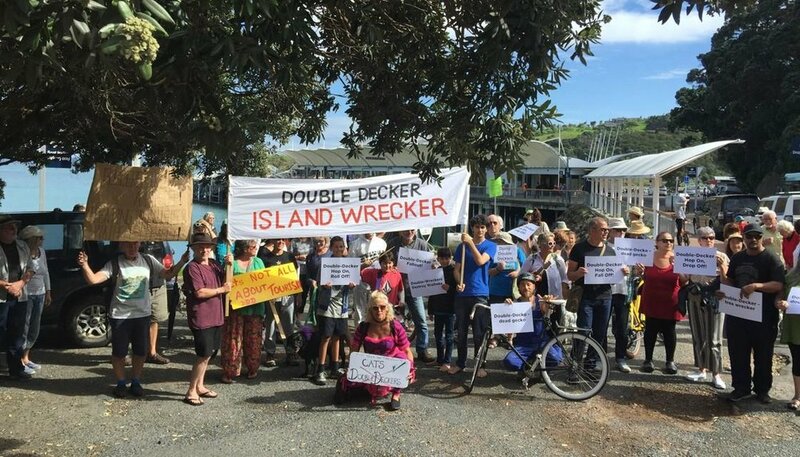 No Double-decky for Waiheke!" and "Double-decker - tree wrecker!" Fullers has agreed to meet protest organisers to try to find a resolution. Ms Honeychurch has in the past campaigned for stronger restrictions on cellphone towers and changes to Waiheke's development and zoning rules.